In 2014, five building professionals including architect Tom Hartman AIA, architect Chris Benedict R.A., builder Paul Eldrenkamp, energy systems consultant Andy Shapiro, and building systems consultant Heather Nolen who was sent as the “Kate Goldstein Scholar for Emerging Professionals.” The group traveled to Sweden and Denmark to learn from innovative sustainable buildings and green energy designs. 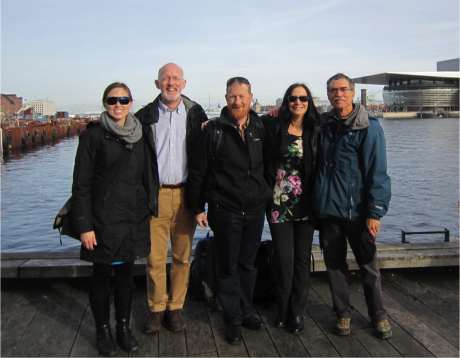 Similar to the Germany and Austria trip in 2011, the 2014 tour offered the opportunity to attend conferences and explore a variety of plans for green building development and fossil fuel replacements in urban centers. The professionals presented their findings from this trip at the Building Energy conference held by NESEA in 2015. 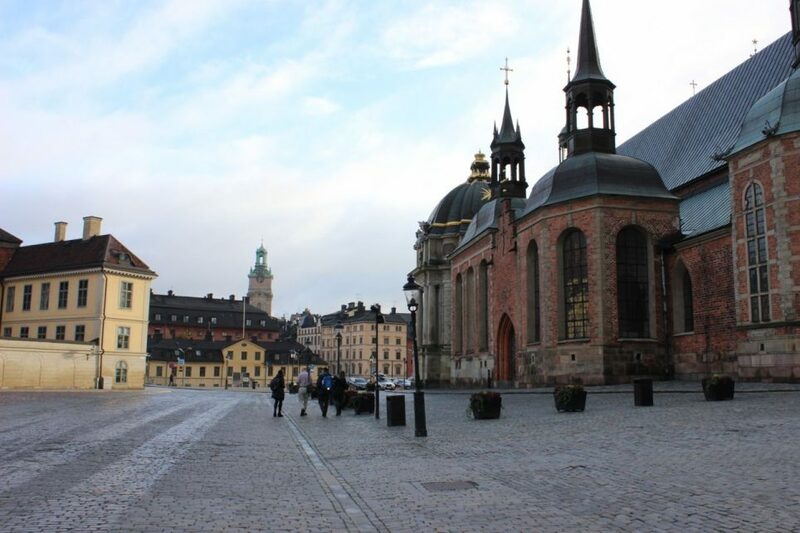 Considered to be a pioneer of green energy in Europe, Stockholm continues to set a high standard for sustainable urban development with the target to be fossil fuel free by 2050. The capital has reduced CO2 emissions by 25% per inhabitant since 1990, and is expanding advanced environmental technology with thoughtful resource management to create a sustainable urban center that will ideally inspire other to follow suit. 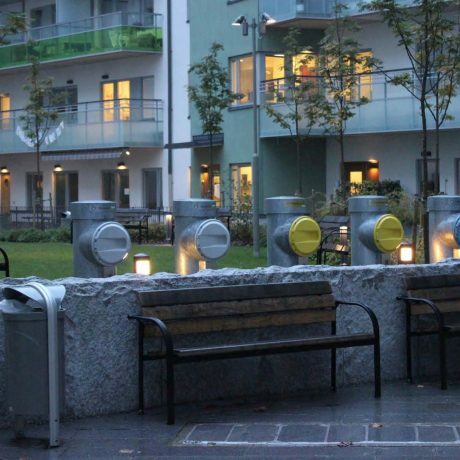 One example of Stockholm’s unprecedented environmental practices is the first heat pump, which was installed in 1977 and distributes district heating sourced from IBM serves. 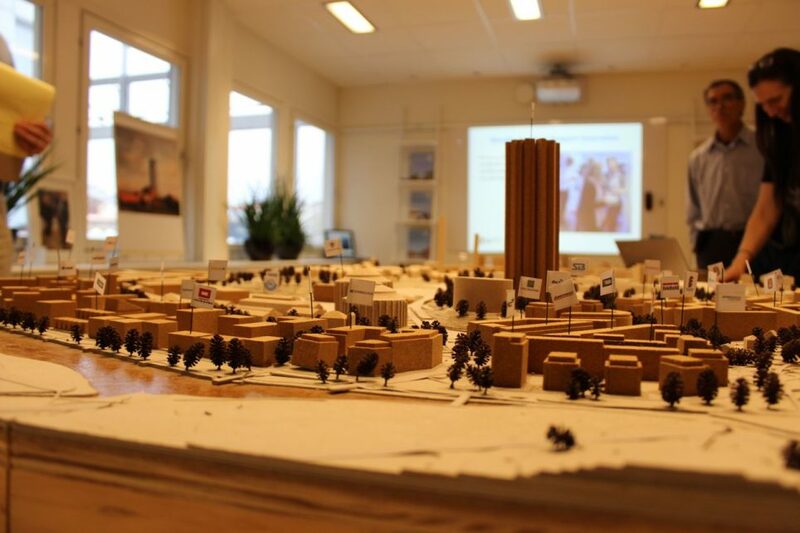 At present, Stockholm relies on the district heating system for 80% of the buildings, totaling 7 MM sq.m. of commercial space. The heating system is operated by private companies and runs on renewable fuels such as sea water, treated sewage water, and wood pellets, and decreased fossil fuels to 20%. The city avoids burning 150 MM gallons of oil per year, and by 2025, Stockholm will supply 98% of the heat demand from district heating. In 2010, the city of Stockholm launched the project Stockholm Royal Seaport in collaboration with renewable energy developers ABB Ltd. The reconstruction of the city focuses on energy consumption, environmentally efficient transportation, adaptation to climate change, recycling and lifestyle issues. The plan to create a world-class sustainable city district anticipates the expected influx in population and energy demand. Stockholm’s new smart grid will use smart energy technology designed by ABB Ltd to harvest and store renewable energy that can be accessed across the city via the smart grid. 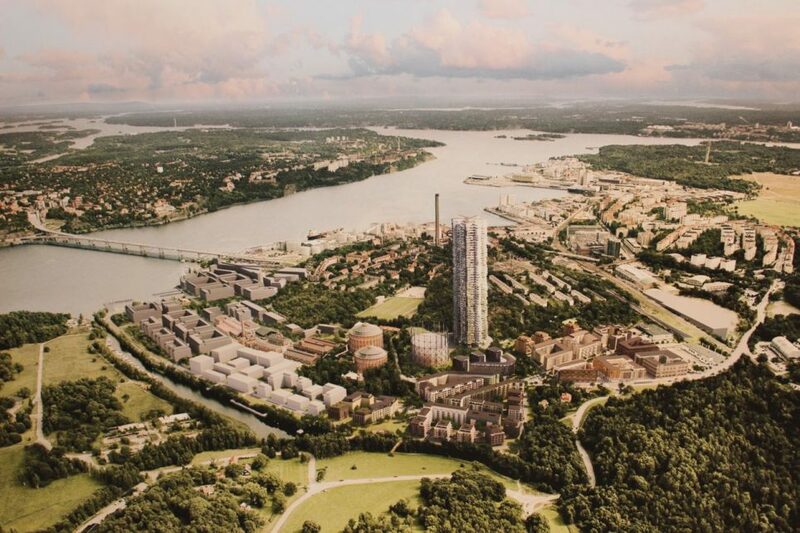 The redesign of Stockholm Royal Seaport is set to be completed in 2030. A report on the project states that in order for the smart grid to operate successfully, the system will require “active houses,” meaning both active consumers and producers. The development will provide 100,000 residential units and 30,000 offices with solar panelled rooftops, generating electricity for the building, personal consumption, electric car charging stations, and returning surplus to the grid. Residents will be able to control and regulate the portion of electricity stored for personal use and the amount fed back to the grid for sale. Consumers will become engaged participants and responsible with their electricity usage as they are rewarded benefits for conserving and feeding surplus electricity back to the grid. The extents of this development will include air flights up to 3,000 ft, heating and cooling buildings, all types of transport, railway and shipping within the city. Building energy use will be conserved and reduced considerably, and public transport services will be doubled, dividing the roads equally with bikes and electric cars. When completed, the Royal Seaport will help Stockholm progress significantly toward the set target of fossil fuel free by 2050. Surrounded by water, the highest point in Copenhagen stands at a scarce 170 meters above sea level. The imminent environmental threat of sea level rise has motivated rigorous goals and adaptations for the city in the next few decades. Copenhagen plans to be the world’s first carbon neutral capital by 2025, while Denmark will be fossil fuel free by 2050. The capital has already achieved a fossil fuel reduction of 38% from 2005-2015, and continues to reduce their consumption on a daily basis. Copenhagen is already equipped with services that make sustainable living possible, including bicycle infrastructure (45% of all trips to work or school are by bike), and district heating that provides 98% of the city’s heating consumption. Now the focus is on the Cloudburst Management Plan which takes action to protect the vulnerable city from future rain storms and sea level rise. In July of 2011, 150 mm of rain fell in two hours, generating damage to critical infrastructure, insurance claims close to the billions, and hospitals that nearly had to be evacuated. Plans for rainwater security have resulted in an estimated 300 projects, investments of 1.5 billion euro, and 20 years of construction time. 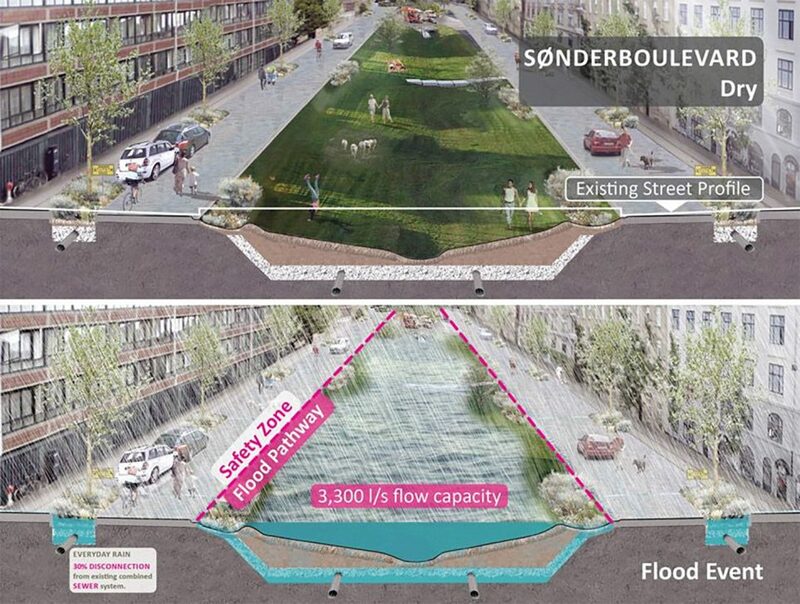 Copenhagen has outlined three methods of protective stormwater design and management, including 1) construct large sewers, underground basins and pumping stations, 2) manage rainwater locally instead of guiding it into sewers, and 3) ensure that flooding takes place only where it does least damage. Executing these water control methods will be accomplished by the increase of green spaces (trees) and blue areas (water features). Not only will these natural features prevent stormwater flooding by absorbing and holding rainwater, they will also moderate the temperature, provide shade and air circulation, reduce air pollution, prevent stress and allow for recreation, and provide habitat for plants and animals. 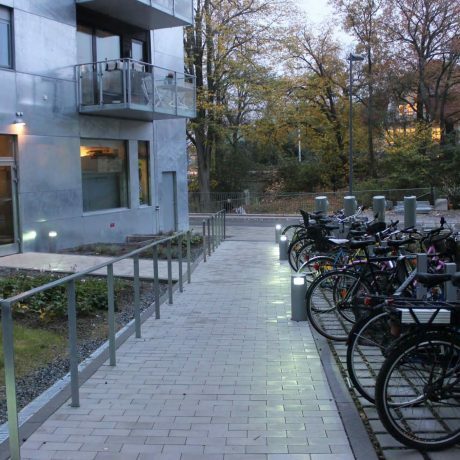 In addition to the vast stormwater efforts, Copenhagen has a few other energy efficient plans in progress. The city plans to produce electricity using 100 wind turbines on and off shore before 2025. The first three wind turbines constructed near the city center supply energy to 3,400 households for an entire year. Another innovative creative adaptation is to introduce a REnescience bioreactor, that will break down organic materials with enzymes and bacteria to turn solid waste from households into high-yield fuel. Lastly, in an effort to cut electricity consumption in half 20,000 street light fixtures will be replaced with LED lights, with improved rendering of the colors for all pedestrians, bikers and vehicles.